Located in a re-developed wine warehouse, Hotel Isaacs oozes the charm and ambience which one would expect from a hotel of such a high standard situated in such a unique location. For the discerning traveller, Isaacs is the ideal choice as it offers a high standard of service at a very competitive price - a true home from home! Featured in each of the 90 pleasantly decorated en suite rooms are cable televisions, direct dial telephones, ironing facilities, safes, tea and coffee making facilities and hair dryers. A number of bedrooms have air-conditioning and data ports. Car parking is available adjacent to the hotel. Spaces are limited and must be prebooked. A charge of ?10 per night applies. The hotel is home to Cafe le Monde, and the Il Vingardo Restaurant. Cafe le Monde serves excellent food throughout the day and in the evening, Guests can relax and unwind and enjoy the fine Italian food of the Il Vingardo Restaurant with nightly happy hours and specials ensure that great value for oney is always on offer. 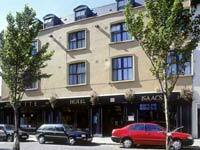 Hotel Isaacs is ideally located on Store Street, close to O'Connell Street, Dublin's main thoroughfare, and an excellent shopping street. Isaacs is also located within five minutes walking distance of Grafton Street and Temple Bar and just ten minutes from Stephens Green, The National Gallery, The Natural History Museum and Government Buildings.